We are Not saying, that was NO plane, Flight 77 that crashed into the Pentagon. We are saying, Where IS Flight 77, at the CRASH SITE? CIT live in Arlington, VA - July 2009 from Citizen Investigation Team on Vimeo. Loose Change: IT IS EVERYONE'S DUTY TO VIEW THIS FILM! Your family and friends need to see this documentary! Do YOU See a Boeing 757?? "Loose Change 2nd Edition" is the follow-up to the most provocative 9-11 documentary on the market today. Movie: http://media.putfile.com/Madison-Griffin 81 min.46 sec. Whatever hit the Pentagon on September 11, 2001 made a hole several meters wide in the front wall between the first and second floors. It emerged three blocks later, leaving behind a perfectly round hole of about 2 ½ yards in diameter. Here's the video stills, notice the outline of a small plane in the first frame ... mmmmmmmm!!! Where are the missing frames ? The following three pictures are extracted from the video shown on CNN site, and said to origin from the department of defense (dod) and to have been shot by the pentagon's parking cctv on september 11 2001. The general impression, at first look, is that something very fast is happening, and has been partially captured by the camera. From the same point of view, the way materials of a 100 tons plane should move and what destruction they should cause in a crash against a building like the pentagon reinforce this impossibility. Taking as references images of crashes against buildings, (in Holland, the Concorde of Air France), it seems evident that the scene of the Pentagon and surroundings after the crash (the lawn intact, ...) is not the scene of a 757 crash. The approach of a 757 towards this building leave a lot of questions unanswered (realism of the approach trajectory, position of the impact point, no track of the landing gear (which gets down automatically near the ground) on the grass, ...). And if it was not a 757 ? This would explain why these frames have been "lost" : they are those on which one can recognize that it this not this airliner which hit the pentagon. The first to claim for this thery was the french journalist Thierry Meyssan : according to him, something (a missile, a remotely piloted fighter) was directed on the pentagon, in order to increase the gravity of the attack of Bin Laden on 9/11, the pentagon being a military target. Four hypotheses can be formulated and argumented : the "cruise missile theory", the "foo fighter" theory, the "remotely piloted fighter" theory and the "suicide pilot" theory. What we could see in this hypotheses if the FBI and/or DOD released the complete video. What could it be ? Hypotheses : it is an AGM 86 cruise missile. I flew the Boeing 747 JUMBO Jet., but not this 757. I retired before this came into service. (2) would have penetrated deeper into the wall and framing structure further than any other part making a definite hole. The belly of the aircraft contains, fuel tanks, baggage, mail bags, and cargo; none of this type debris can be seen. Assuming 8600 gallons of kerosene fuel @ specific gravity of approx 6.9 lbs/gal (temperature considered) weight of the fuel would be close to 60,000 lbs and would splatter everywhere. Where are the seats, those with passengers buckled in would be ripped our of the floor, for that matter, where are the passengers? I have never seen an aircraft accident where the aircraft evaporated upon impact, water, and or buildings. 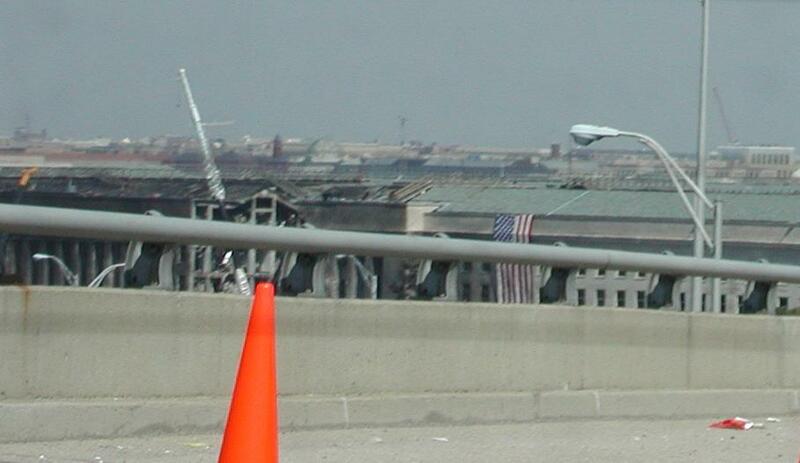 If these pictures were taken within 3 days after 9/11, there would have been definite remains of parts. I don't see any. However, digital computer photos can be doctored up to suit any lawyers cause. From the photos shown, there ain't no fly in this pudding. FLIGHT 77-SO WHERE IS THE PLANE? note that the FBI confiscated his security camera tape right after the crash. Does the math and physics add up? Does the Math & Physics Add Up? 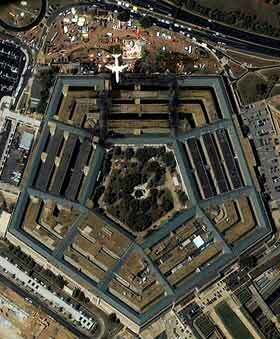 Where did the plane hit the Pentagon? HERE'S THE PLANE! FLIGHT 77 ? Where is the Commercial Jet??? hijackers who were aboard the aircraft. CAN YOU SEE A PLANE IN THIS PHOTO? THERE IS SOMETHING CALLED "PROOF," AND THIS IS IT!! MR. AND MRS. AMERICA -- THERE IS SOMETHING CALLED "PROOF," AND THIS IS IT!! SO BUY YOURSELVES A CLUE -- THE BUSH-MOB HAS TOTALLY LIED ABOUT WHAT HAPPENED ON SEPTEMBER 11, 2001!! THEY THEMSELVES ARE THE PRIMARY MASTERMINDS AND PERPETRATORS OF ALL THE TERRORISM UNLEASHED UPON AMERICA THAT DAY. ALL OF IT!! BUSH AND HIS ASSOCIATES ARE UTTER TRAITOROUS FILTH WHO MUST BE REMOVED!! of Flight 77 is the only one they do not have shown. you this story in the first place and you'll start asking yourself lots of other questions besides. Don't worry! This is perfectly normal! Source: www.reseauvoltaire.net - The photographs are official images and available on US army sites. See also the larger collection of photographs in our "Pièces à conviction" gallery - Translation: Mr Sly - NB: Appearing on bookshelves end of March, the investigation by the Chair of the Réseau Voltaire into the September 11 attacks, examining the Bin Laden networks and American secret service involvement. ABSOLUTE PROOF That NO PLANE Hit Pentagon, 911!!!!!!!!! In the image below, notice the reinforcing of the second floor just to the left of the collapsed area. For a wing to have gone through and undercut this area, the plane would have to have skidded across the ground as it plunged into the first floor. If that is the case, whatever wreckage there were could be under the debris from the upper floors. Which proves... it's a lie! Why are we being told all these different stories? NSA ALAMEDA, YSD-46 MARY ANN.... 1956 TO 1960 CRAIN OPERATOR. You can always find the plane! FLIGHT 77: SHOW ME THE PLANE! ALL THESE PHOTO'S AND STILL NO PLANE! 03/04/02 Hunt the Boeing Back by popular demand! rather than a passenger jet. If the plane did not crash into the Pentagon, where is it? But a lot of people emailed me asking me to put the link back up, so I put the link back in. A collection of high res photos of the Pentagon Damage. informants and other government propagandists. Photo of aircraft debris at the Pentagon impact site. A Pentagon worker holds what is believed to be a piece of the aircraft that crashed into the Pentagon on Sept. 11, 2001. Fire truck 345 from Metropolitan Washington Airports Authority Fire Department throws a stream of water into the collapsed point of impact as smoke billows from the Pentagon shortly after an airplane slammed into the west side of the building. More photos, where is the plane? 9:36 National Airport instructs a military C130 (Golfer06) that had just departed Andrews Air Force base to intercept and identify it. Golfer06 reports it is a B767, moving low and very fast. Now, imagine that the lines in this photo have been painted on the ground. Then they would appear in other photos of the scene. In all such photos, the ratio of the sizes of the angles between the lines will remain the same, namely, 6:6:8. Knowing this will allow us to estimate the size/extent of the fireball. We proceed to mark these lines on the following photo. First, we draw the two lines that bound the heliport control tower. To do this, it is necessary to estimate the position of the base of the heliport control tower. I have marked the base of the tower in magenta. Now we measure the angle between these lines. It is 4.5 degrees. To keep the 6:6:8 ratio, the angles must be 4.5, 4.5 and 6 degrees, respectively. To get the line that bounds the back of the fireball, we measure 6 degrees toward the left side of the photo and draw a line. To get the line that bounds the left (left as in the "impact 2" photo) edge of the part of the fireball that is in front of the Pentagon wall, we measure 4.5 degrees toward the right side of the photo and draw another line. Having done this we obtain the four white lines illustrated. These are the lines we would see if we had painted the lines in the "impact 2" photo, on the ground. To make sure we all know the positions of the points of interest, note that the white lines emanate from the security guard's booth, where the security camera is housed, the heliport control tower is the building whose base has been marked in magenta and that the point of impact (center of the explosion) has been marked with a small red dot. We now wish to mark the area covered by the explosion. The center of the explosion will be approximately the point of impact of the nose of the aircraft. At the time that the "impact 2" photo was taken, the maximum distance that the fireball would have extended from the center, will be in the direction directly away from the wall, and will be bounded by the leftmost white line. This allows us to mark out the maximum (physically possible) area covered by the fireball at the time the photo was taken. I have marked this area with a red semicircle. Remember, that this circle represents the maximum area covered by the fireball (at least the part of it that was in front of the Pentagon) at the time that the "impact 2" photo was taken. The portion of the fireball visible in section B of the "impact 2" photo, must be located within the red semicircle and between the leftmost 2 lines. The portion of the fireball visible in section A of the "impact 2" photo, must be located within the "slice of pie" shaped area that projects out of the semicircular region. Flight 77 - 58 passengers? Very intriguing! I have to admit, I could not find a trace of the Boeing 757. Their families believe the government's version. FBI evidence teams combing the area of impact along the building's perimeter found parts of the fuselage from the Boeing 757, said Michael Tamillow, a battalion chief and search and rescue expert for the Fairfax County, Virginia, Fire Department. No large pieces apparently survived. Agents also were looking for the plane's black box and flight data recorder. Where the black boxes ever found? to the 58 passengers that supposedly perished during the crash if the theory is to hold. There are 58 persons missing. There are families here in Los Angeles that went through the grieving process. If there was no Boeing 757 crash at the Pentagon then what happened to Flight 77??? The military screw-up nobody talks about. Photo of any part of Flight 77 plane. have the brains god gave them. the Pentagon with 64 people aboard. Flight 77 - Truth, maybe! Look at this video of first plane hitting WTC. The plane has a wingspan of 156 feet and the tower is 208 feet on a side. Size of impact is more like a missile hit. Or maybe the impact was from another side and this is what came on through? Pause the playback at impact. aboard American Airlines Flight 77. Perhaps the images you posted come from low quality cameras, but burning jet fuel should be a dark orange and full of soot, just like we saw at the WTC towers. The flames in these photos seem a bright white, which implies plenty of oxygen, which implies a bomb. The color of the flames and the lack of soot should be investigated. Let us not overlook, the fact that the so-called plane, just so convienently happened to crash into the section of the pentagon that was temporarily closed due to repairs, and no one was really in there. Also i remember that day better than anyone, because i was glued to my radio, tv, and HAM, from 8am EST untill about 3am that evening. I seem to remember the first news agency's saying a truck exploding outside the pentagon, and also there was a quick story or two about a fire or explosion that happened directly behind the white house, i think they were saying it was in an old office building behind the capitol building. In addition also, i read a news article from WWW.Rense.com around that time, that stated it was a young man, flying a small single person plane, that landed outside the white house, and blew up on the lawn. The electronic news media have broadcast repeatedly the attack on the World Trade Center. They are perhaps the most dramatic news images since the explosion of the first atomic bomb over Hiroshima. Now word has reached us that federal investigators may have video footage of the deadly terrorist attack on the Pentagon. A security camera atop a hotel close to the Pentagon may have captured dramatic footage of the hijacked Boeing 757 airliner as it slammed into the western wall of the Pentagon. Hotel employees sat watching the film in shock and horror several times before the FBI confiscated the video as part of its investigation. It may be the only available video of the attack. The Pentagon has told broadcast news reporters that its security cameras did not capture the crash. The attack occurred close to the Pentagon's heliport, an area that normally would be under 24-hour security surveillance, including video monitoring. Now word has reached us that federal investigators may have video footage of the deadly terrorist attack on the Pentagon. A security camera atop a hotel close to the Pentagon may have captured dramatic footage of the hijacked Boeing 757 airliner as it slammed into the western wall of the Pentagon. Hotel employees sat watching the film in shock and horror several times before the FBI confiscated the video as part of its investigation. It may be the only available video of the attack. The Pentagon has told broadcast news reporters that its security cameras did not capture the crash. The attack occurred close to the Pentagon's heliport, an area that normally would be under 24-hour security surveillance, including video monitoring. This picture shows two vehicles on Route 27 that were damaged by light pole debris, clipped by the Flight 77 aircraft as it passed overhead and across Route 27, then plowed into the Pentagon. The pole to the left is one of several that were clipped by the aircraft. The pole is also not complete, you can see it was sheered at the top. Without the eminent Barbara Olson and her alleged emotional telephone calls, there would never be any proof that humans played a role in the hijack and destruction of the four aircraft that day. Lookalike claims surfaced several days later on September 16 about passenger Todd Beamer and others, but it is critically important to remember here that the Barbara Olson story was the only one on September 11 and. 12. It was beyond question the artificial seed that started the media snowball rolling down the hill. We now know Flight 77 was not crashed into the Pentagon. Pentagon 2001 : Pentagon 2001 / 9 / 11 : the fraud ! HERE IS A WITNESS ACCOUNT OF WHAT HAPPEND. What really happened on Sept. 11th? How Did United Flight 93 Crash? 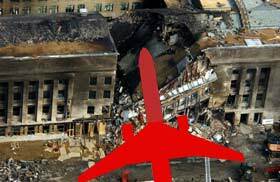 The US Authorities have tried to make believe that the damage caused to the Pentagon, on September 11, 2001 was caused by the crash of a hijacked Boeing airliner on the building. This lie was meant to hide the fact that a bombing attack was in fact carried out by a group of people who had authorized access to the Pentagon and that the target was not the Department of Defense in general but the new Navy Command Center. The US authorities have also lied in order to hide the existence of a secret CIA base within the World Trade Center and its illegal activities. But most of all they have put great efforts into concealing the negotiations carried out between George Bush and the conjurors on September 11, as well as the agreement that was reached on that day. With the help of their hired agent, Osama Bin Laden, they have channeled the sadness and the anger of the US public opinion towards foreign scapegoats. In his book "L'Effroyable imposture" (The Dreadful Imposture), Thierry Meyssan reveals the secrets behind 9-11. He analyses the power shift within the US political establishment and the rocketing of the military expenses. He denounces the hidden agenda behind the war in Afghanistan and the secret aims of the "War on Terrorism". A must read if you want to understand where the US leadership is leading its country. Where is flight 77 ??? "I took these pictures seconds after I saw the "plane"
100ft ahead and crashed into the side of the pentagon". We should ask this guy. Where is flight 77 ? the 911. People were listening to radio stations. Here are photos from a Free Republic posting.